The planets move in elliptical orbits around the Sun at one of the foci of the ellipse. The line joining the Sun and the planet sweeps out equal areas in equal time intervals. The square of the time period of a planet is proportional to the cube of the semi-major axis length of the elliptical orbit. The Kepler's first law identifies the type of orbit in which a planet moves. It says that all planets move in elliptical orbits with the sun at one of the foci of the ellipse. A circle is also a special case of an ellipse. So the orbit of a planet is an ellipse. In Figure 1 a planet $p$ moves in an elliptical orbit with the sun at one of the foci $S$ of the ellipse. 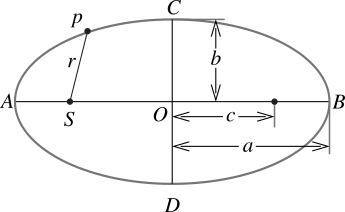 Figure 1 The orbit a planet moves is an ellipse. The axis $AB$ joining the two foci passing through the centre of the ellipse $O$ is the major axis of the ellipse. So in Figure 1 the length of the major axis is $AB = 2a$ and $a$ is the length of semi-major axis of the ellipse. And $CD$ is the minor axis of the ellipse which passes through the centre being perpendicular to the major axis. The minor axis has length $2b$ and $b$ is the length of semi-minor axis. The distance from one of the foci to the centre of the ellipse is $c$. The ratio $c/a$ is called eccentricity $e$ of the ellipse. For a circle $c = 0$ and the eccentricity is also zero. Therefore, a circle is an especial case of an ellipse. According to Kepler's second law a planet moving in an elliptical orbit sweeps out equal areas in equal time intervals. To prove this consider a planet moving in an elliptical orbit around the Sun at one of the foci of the ellipse as in Figure 2. 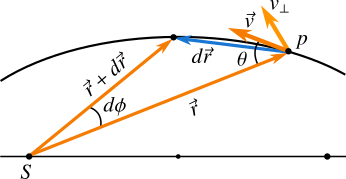 Figure 2(a) A planet moves in an elliptical orbit around the sun at one of the foci of the ellipse. Figure 2(b) Exaggerated view inside dashed rectangle in Figure 2(a). where $M_p$ is the mass of the planet. 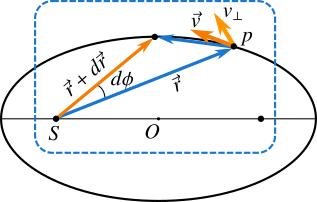 The above equation shows that the areal velocity of the planet around the Sun is constant which proves Kepler's second law. The conservation of angular momentum of planets is also the fact that why the planets move in plane around the Sun. The above equation shows that the square of the time period of revolution of the planet around the Sun in its elliptical orbit is proportional to the cube of the semi-major axis length of the elliptical orbit.